At Hammerworks we handcraft each Early American Antique Wall Sconce in a variety of styles and finishes. Most importantly since 1979 we have been leading the way in the Colonial lighting industry. Not only that, we employ the same techniques as the original craftsmen. Therefore you will consistently receive a quality handmade 18th century reproduction wall sconce. In addition we use only solid copper, brass or tin to create each wall sconce. Consequently this allows you versatility in coordinating with the color scheme and style of any setting. Whether you are decorating a classic Williamsburg, Colonial, Cape Cod Style Cottage or New England Farmhouse, we offer a sconce style that is just right. As a result our Colonial wall sconces combine beauty and function making them a perfect decorating accessory for any home. 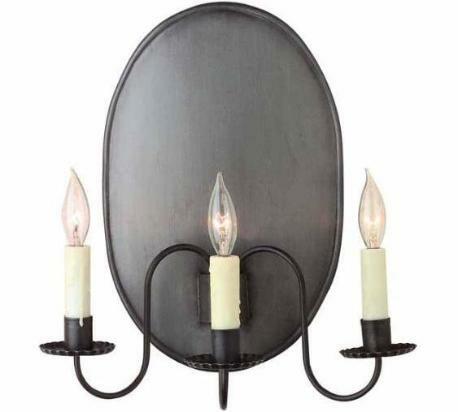 In an area where additional lighting may be needed, we offer many of our sconces with 2 or 3 candles. Furthermore each sconce accommodates 60 watts per candelabra socket, assuring plenty of illumination. With Hammerworks capability to create and handcraft sconces, custom work is always welcome. 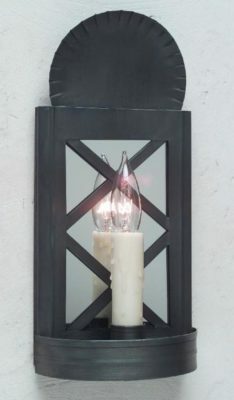 If you prefer a more primitive wall sconce, each Hammerworks wall sconce is available in a non-electric candle version upon request.